Jaundice is the yellowish discolouration of the skin caused by an increase of bilirubin in the blood. Neonatal jaundice is jaundice that occurs within the first month of baby’s life. Bilirubin is a pigment produced from the breakdown of red blood cells. It is then processed in the liver before being passed out into the stools. How common is jaundice in babies? Jaundice is very common and occurs in 50% of babies in the first week of life. Physiological jaundice is the most common cause of neonatal jaundice and is harmless to your baby. The onset of physiological jaundice is after the first 48 hours and will subside by the end of the first week of life. It is caused by the normal breakdown of red blood cells and the immaturity of the liver. As such, late preterm babies of between 34-36 weeks are at higher risk of developing jaundice if they do not receive early treatment. Incompatibility between mother’s and baby’s blood group (in mothers with Rhesus negative or Blood Group O blood). Babies with G6PD (glucose 6 phosphate dehydrogenase) deficiency in their red cells resulting in their instability on exposure to certain agents. This occurs in less than 5% of babies. All newborns are screened for G6PD deficiency at birth. Infection in the newborn which makes the baby unwell and needs in-hospital treatment. What causes jaundice in babies to be prolonged? Breast milk jaundice – Babies on exclusive breast feeding may have prolonged jaundice. As long as the mothers are not taking traditional herbs, the jaundice will be harmless to the babies. Obstruction of bile flow from the liver into the intestine. This rare condition will result in pale coloured stools and dark or tea coloured urine. Congenital hypothyroidism – This condition occurs in 1 per 4000 babies. Currently the national screening programme of newborn cord blood for congenital hypothyroidism is an ongoing programme in all government hospitals and clinics. What should I do if my baby has jaundice? Term baby with no risk factor for excessive red cell breakdown. Jaundice appearing after the first 48 hours of life and not increasing in severity. Healthy, active and feeding well. What are the danger signs that I should be aware of? Jaundice appearing within the first 24 hours of life. If the result of the newborn screening shows G6PD deficiency. If previous babies in your family have severe neonatal jaundice. If your baby is unwell and not feeding satisfactorily. If there is presence of pale coloured stools or dark or tea-coloured urine. Your doctor will assess your baby clinically, proceed to do relevant investigations and then institute appropriate treatment. He will advise you on the specific situation of your baby. What problems can jaundice cause? Deafness from damage to the part of the brain controlling hearing. Early intervention of babies at risk of severe jaundice will prevent this complication. What are the ways to treat this condition? 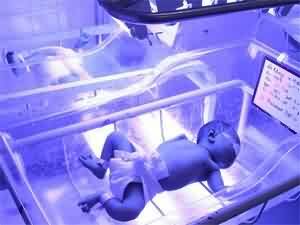 Your baby will be put under a phototherapy light unit. The blue coloured component of the light can convert the bilirubin to a non-toxic product. Newborn undergoing intensive phototherapy for severe neonatal jaundice. The toxic bilirubin level for term babies in the first week of life is usually taken as more than 20 mg/dL (340 umol/L). Exchange transfusion is used as a last resort to try to avoid brain toxicity due to severe neonatal jaundice. The levels for exchange transfusion will depend on many factors including the age of the baby and the cause of the jaundice. It is important to identify and monitor babies at risk of severe jaundice. Early detection of babies with jaundice needs to be done to ensure early and appropriate intervention. What else can be done for babies who had suffered severe jaundice? All babies with high bilirubin level (20 mg/dL or higher) should be followed up in a paediatric clinic to check on the hearing and development. Some babies may need to be referred to the audiology department for a hearing test to exclude high tone deafness. Brain damage due to severe jaundice (kernicterus} should be prevented. If it happens, the child should be referred to a multi-disciplinary team for rehabilitation.